Nobody ever became successful by sitting around doing nothing unless they were already born into wealth. To get anywhere in life takes a certain mindset and work ethic. Unless you don’t have any big plans on achieving big things down the road, you need to have the type of attitude of those who achieved success before you and those who will after. Many of us flounder and get nowhere while promising to do this and that. Many if not most of us are life-long procrastinators who will do only the bare minimum. Perhaps it’s a genetic trait and we don’t know any other way because it’s in our DNA. But then there are those who went on to become successful simply through adopting the right mindset. Truth be told, everything starts with our mindset. It’s how we look at ourselves and our views of life and our aspirations and desire to achieve and succeed that will decide our destiny. We don’t know what our destiny is until we give our all. And the only way to get there is simply by getting things done. That means get off our couch, make plans and take action. We all have the potential to do so much more than we ever thought we were capable of simply by having the right attitude and perspective. Let us dream but let us execute. That’s the attitude you need. 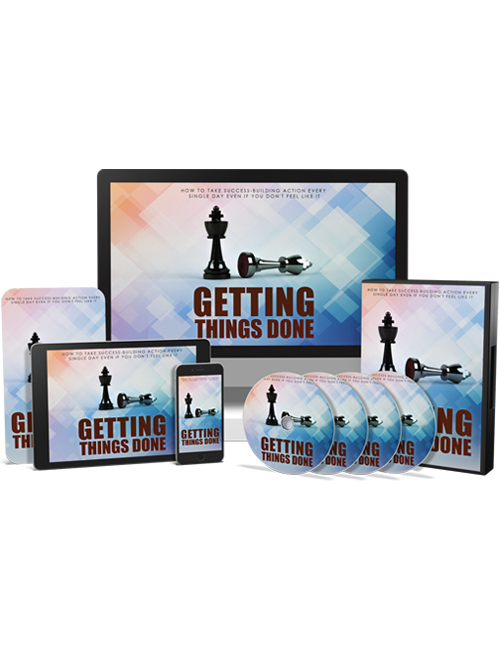 This video course which complements the Getting Things Done ebook is all about achieving and taking action. You’ll learn about the mindsets needed to get onto the path of success, how to be fully effective, taking a look at what you’re doing and changing it up if it’s not getting results, adopting the right practices to getting things done and so much more. If you’re ready to begin that journey then this is the best download for you as of right this moment. Get it now.